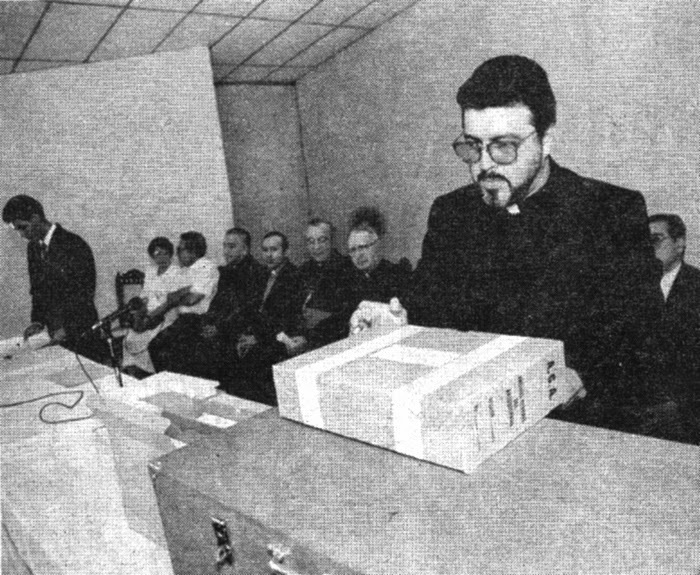 The closing of the diocesan process (1996). San Salvador canonization office. The Pope's action followed a vote earlier that same day whereby a commission of cardinals gave their approval. The vote of the cardinals, like that of the theologians before it, was unanimous, according to Archbishop Vincenzo Paglia, the postulator of the Cause. The decree was to have been delivered to the Pope on Thursday, but he asked to have it right away. The cardinals’ vote itself marked a sudden acceleration for the Romero cause, given that the cardinals’ ratification of theologians’ votes normally take several months to come. To wit: said lapse of time was five months in the case of Saint John Paul II; six months in the case of Opus Dei founder Saint Josemaría Escrivá; and eleven months for Bl. Jerzy Popieluszko, the Polish martyr beatified via fast track a mere 22 years after his death at the hands of the Communist regime. By contrast, the wait has been less than one month for Archbishop Romero—the briefest of all the cases studied by Super Martyrio. Not so for the process that went before. Super Martyrio has learned details of the cause that corroborate the legend of a cause of beatification blocked by Vatican authorities on suspicion of doctrinal irregularities and ideological exploitation by the Left. But, according to the information, the legend is wrong in supposing Popes John Paul II and Benedict XVI had “blocked” the cause; in fact, the obstacles came from the Vatican Curia, and Pope Wojtyla in particular gave his support to counter their opposition, while Benedict remained neutral when he was part of the Curia and was favorably inclined as Pope. Although some parts of the narrative had already been aired, dramatic new details illustrate the diversion and almost total obstruction of the cause. After being established by the Salvadoran Church, the cause spent most of its existence in a state of bureaucratic paralysis: 15 of the 21 years since its institution were spent under a “continuance” dictated by the Congregation for the Doctrine of the Faith in 1998, which was not officially lifted until April 2013. During that time, it was subjected to three intensive tests outside of the normal path for a cause. First, from 1998 to 2004, Romero’s homilies were subjected to a thorough study, on suspicion of deviation from orthodoxy. Second, even after being absolved of doctrinal errors, Romero was subjected to an analysis of the relationship between his faith and pastoral action. More recently, Vatican authorities signaled concerns about “prudential” considerations, as Pope Francis put it this past August. In fact, the enemies of Archbishop Romero struck even before his cause was formally filed. In 1993—the year before the start of the cause—they presented objections to the Vatican Secretariat of State, raising concerns about Romero. (That the objections were submitted to this body suggests that they came from high levels.) The argument leveled to defeat the cause, exposed previously in this blog, was that Archbishop Romero was a naive Saint, who possessed spiritual virtues, but also suffered from psychological weaknesses that left him prone to manipulation by a “cadre” of extremist priests, who played him like a puppet, inserting revolutionary words into his sermons. The popular belief that Pope John Paul II sought to block the cause is disproved. In fact, when people opposed to beatifying Romero launched their first strike, the Polish Pope had preempted them. As early as 1983, after visiting Romero’s tomb, John Paul had given his “total approval” for initiating a beatification process, according to Monsignor Delgado, who asked the Pontiff’s permission on behalf of the local church in March of that year. John Paul even advised the Salvadoran Church about the right time to start the case. In Making Saints: How the Catholic Church Determines who Becomes a Saint, Who Doesn’t, And Why (1996), Kenneth Woodward reveals that John Paul asked the Salvadoran Church not to begin the process until a time in which they could be assured of having a positive reception in the Vatican. Woodward, p. 45. In fact, Super Martyrio has learned that in April 1997, the Congregation for the Clergy—led by Castrillón Hoyos—revived the manipulation hypothesis originally aired in 1993, with Jon Sobrino as the target of accusations of having controlled Romero, to stop the beatification. The following year, the possible beatification of the Salvadoran martyr was formally derailed when the file was transferred from the Congregation for the causes of Saints to the Congregation for the Doctrine of the Faith—the church body that had led the campaign against Liberation Theology in previous years. In March 1998, the CDF ordered freezing the beatification cause until an exhaustive analysis of all Romero’s homilies could be carried out to search for doctrinal defects—presumably based on the suspected manipulation and influence of Sobrino. When Pope John Paul II inserted Romero’s name on a list of “witnesses of the faith” of the 20th century to be honored at the Colosseum in Rome during the Jubilee of the year 2000, Romero was being investigated on suspicion of possible heresy or at least Marxist influence. “Remember, father of the poor and the marginalized, those who witnessed to the truth and charity of the Gospel by giving their own lives”, said the prayer raised that May 7, 2000: “zealous pastors, such as the unforgettable Archbishop Oscar Romero, murdered at the altar during the celebration of the Eucharistic sacrifice”. The ailing Pope entered Romero’s name in the list in his own hand. However, it would be over four years until the CDF concluded its investigation into Romero’s homilies. Although no doctrinal error was found, the devil’s advocates did not quit and immediately insisted on a second inquiry into Romero’s pastoral action, which was ordered in November 2004. Emboldened by the finding of no doctrinal error, the postulator of the cause, Monsignor Vincenzo Paglia, apparently tried to force a vote in the Congregation of Saints in 2005, the year of the 25th anniversary of Romero’s death. Paglia told John Allen that he expected “good news within a month” in September of that year. However, Paglia lost a great ally with the death of Pope John Paul II, and a year later authorities unveiled in public statements that the cause was proceeding slowly. In 2006, the Vatican issued a finding strongly criticizing Sobrino’s work. Despite the impasse, the doubts about Romero were gradually dissipating. In a press conference in May 2007, Pope Benedict said he had no doubt that Romero merited beatification, and in February 2008, he said in a speech to Salvadoran bishops that Romero was a “Pastor full of love for God” who had promoted the evangelization of El Salvador. But even these encouraging statements reflected vestiges of the manipulation hypothesis, since it had supposed that Romero exhibited personal holiness, but that his personal virtue was tainted by a so-called exploitation. In his comments to the press, Benedict emphasized that “the problem” had been that “a political party wrongly wished to use him as their badge, as an emblematic figure. How can we shed light on his person in the right way and protect it from these attempts to exploit it? This is the problem,” he said. After mentioning Romero in three public speeches between 2007 and 2008, Benedict does not utter his name again in public for the rest of his pontificate. Three years later, in April 2011, the CDF pronounces itself: the exploitation concerns raised by Benedict remained unresolved. The “continuance” ordered in 1998 would stay in place. However, the causes of the suspension were eroding. Initially, the concern had been doctrinal error. Not finding it, Romero’s actions were scoured for pastoral defects. Now, the only remaining issues were possible manipulations and certain ambiguities. Of course, on the opposite column, Romero had achieved a higher international profile than other servants of God in process of beatification. In 2012, the year prior to his historic papal resignation, Benedict XVI told Msgr. Paglia and Archbishop Gerhard Ludwig Müller, the new authority at the CDF, that the time had come to lift the “continuance” and allow the cause to run along a normal course. The decision was formalized by Pope Francis in April 2013. Since then, Msgr. Paglia resumed the work that had been halted in 1998, of drafting the Positio Super Martyrio—the closing brief to present to the Congregation for the causes of Saints. After presenting it in November 2014, it was only two months before a panel of nine theologians voted unanimously that Romero was a martyr, as the Salvadoran Church had originally proposed 21 years before. On the day the Pope approved the decree certifying Romero's martyrdom, the Salvadoran Church announced that all church bells throughout the country will peal at 6 o’clock to celebrate the news. The date of the beatification is being worked out, but its location will be in San Salvador, at the Divine Savior monument, led by Cardinal Amato of the Congregation for the Causes of Saints. Msgr. Delgado is in Rome to work on a date with Vatican authorities. Archbishop Paglia has set a press conference for Wednesday. Super Martyrio will continue to monitor and report on the details.